With the Kayak Cart, getting your kayak or canoe to the water by yourself has ever been easier. Never carry or drag it again. The Kayak Cart’s durable design reduces the carry weight of your kayak or canoe by more than half. Simply lift the other end and away you go. Three optional tires types and sizes means you and your kayak can traverse any terrain, including soft sand. 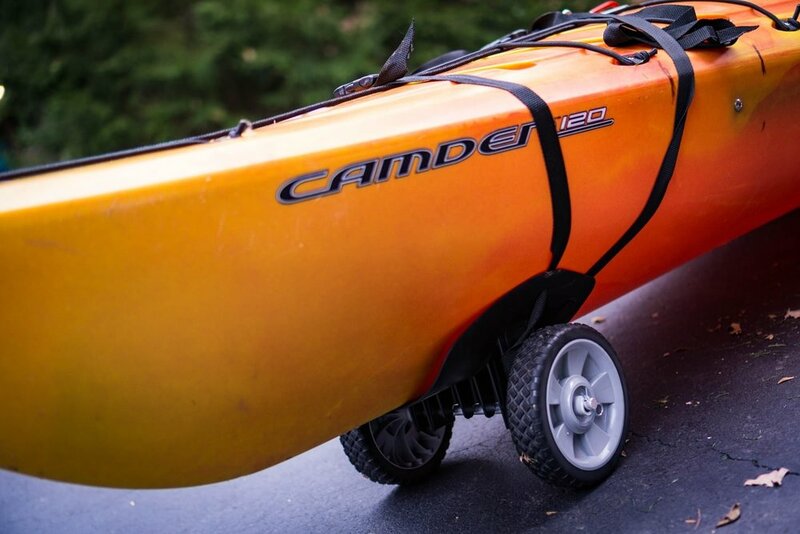 Lightweight and compact, the Kayak Cart can be easily stored in your kayak or canoe. Taking it with you means you’ll have absolute boating freedom. By the year 2000, for the first time kayak sales equaled canoe sales. Today, the number of kayaks sold outnumbers canoes by around ten to twenty-times. As a rule, canoes are used and carried by two people. But kayaking is normally a solo sport. So when I bought my first sea kayak, which weighed well over sixty pounds, I quickly realized I needed a way to help me transport it to and from the water on my own. While working on the Kayak Cart, I realized I had the same need to transport my canoes. So I began to work on developing a design for canoes at the same time. This led to my exploring and building several different prototypes over the years, experimenting with many different types of materials, designs and processes. Over time I’ve added several more kayaks and canoes to my collection. And I’ve refined the design and manufacturing process of the Kayak Cart so that the current automotive-grade, injection-molded plastic design will fit just about any make and model of kayak and canoe. Using the Kayak Cart reduces the weight of the boat by more than half. For instance, instead of moving a boat that weighs fifty pounds, you’re actually moving a boat that now weighs only about twenty pounds. And just about anyone can manage and maneuver a weight that light. Since a lot of today’s kayaks are asymmetrical in shape, the best place to attach the Kayak Cart is about 18-inches in from the tip of the bow or stern, rather than the middle. These end sections are also the strongest part of the boat, unlike the middle, which can be damaged by other carts that attach to that section. I also developed a shoulder strap for the Kayak Cart to make it easier to use and hands-free when transporting heavier boats, or for portaging over longer distances. 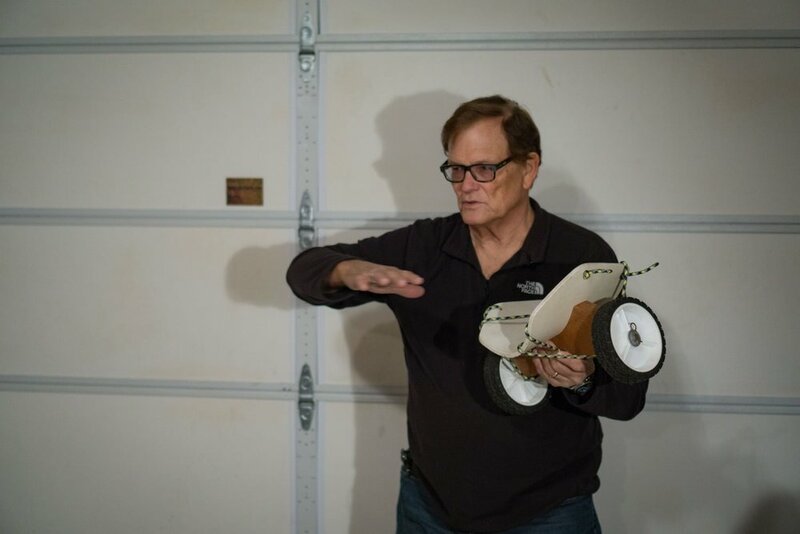 I also developed three different wheel types so that a fully loaded kayak or canoe attached to the Kayak Cart can traverse any terrain, including soft sand. I’ve spent most of my life pursuing my love of paddle boating. And I’ve spent the last twenty-five years of my life developing the easiest way for one person to transport their kayak or canoe to and from the water.